Convert DWG to vector files. Convert DXF to vector formats. No need for other CAD applications. 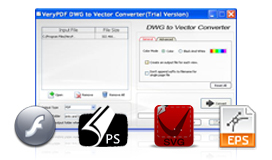 DWG to Vector Converter can convert CAD files to vector files of WMF, SWF, EMF, PS, SVG, EPS, XPS, HPGL, and PCL. It also support export CAD files to PDF files. With this application, you can easily save your CAD files in multiple file formats. DWG to Vector Converter supports color and black-and-white color modes to save output vector files. It also can set page width and height in the unit of point. You may also set the print resolution in DPI for created vector images. 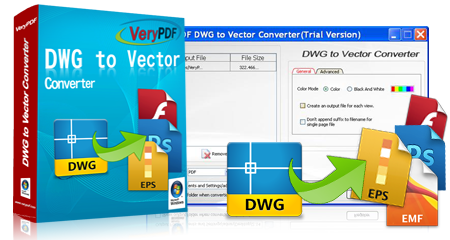 DWG to Vector Converter is independent of any CAD application, and you may convert your CAD files without installing any CAD application. Input file formats: AutoCAD file formats like DWG and DXF. Output file formats: PDF, and regular vector image formats including WMF, SWF, EMF, PS, SVG, EPS, XPS, HPGL, PCL, etc. Support general output setting like color mode setting. Support advanced output setting like font setting, resolution setting, and page size setting. Show the progress of conversion in the interface. Automatically open the result file after conversion. Show the output folder when conversion is finished. The interface is interactive and user friendly. Independent application which does not require AutoCAD or other CAD software installed on the computer. Create a vector file for each view within a CAD file. Append no affix to filenames for single page files. Automatically show the folder when the conversion is finished. Convert Word, Excel, PowerPoint, HTML and image to PDF. Create PDF from printable documents with virtual printers.